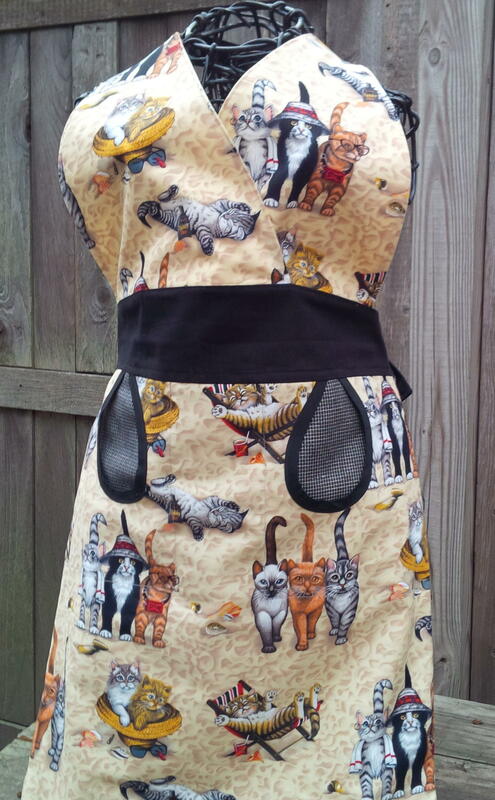 We frequently are asked to make custom orders; it’s really fun to design something that is just perfect for the owner or the person who will receive the apron as a gift! 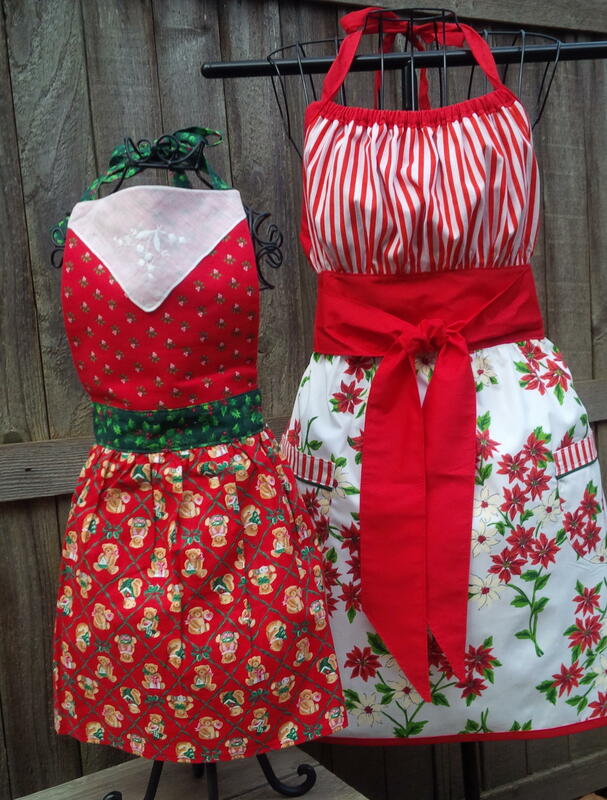 Here are a few examples of custom orders and holiday looks we have done. The Christmas season will soon be upon us; aprons make great gifts for the hostess, or for that hard-to-shop-for person on your list! 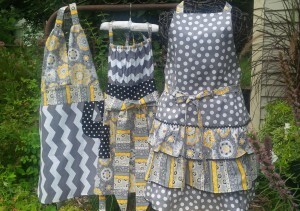 We did several aprons in these gold & black prints last year, and loved them so much we had to find a way to use up the fabric we had left! From left; two Laura style aprons, and a Josephine with maroon green and black. Aprons for everyone on your gift list! 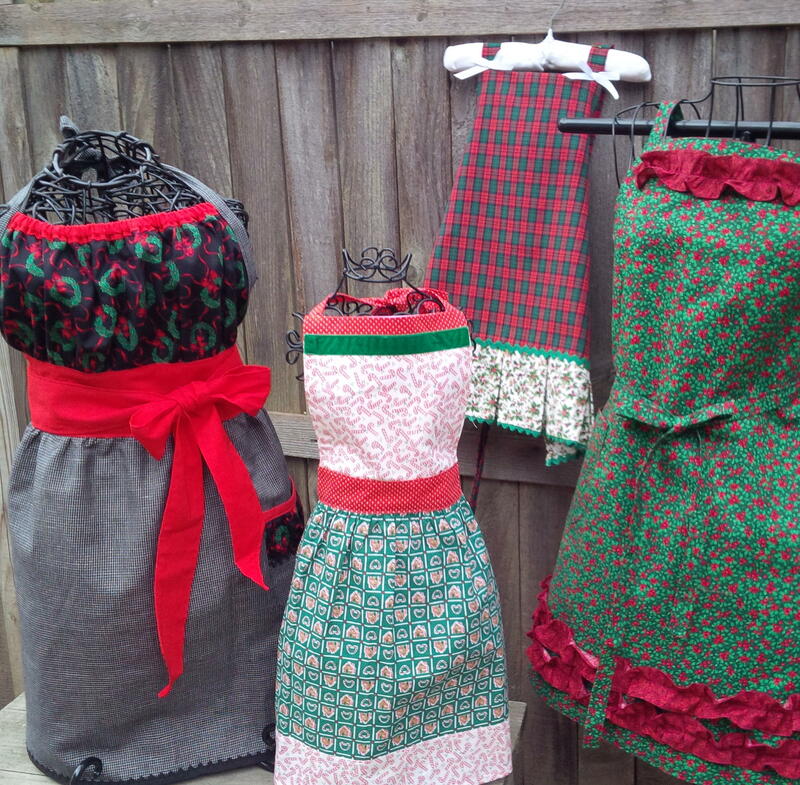 From left to right; Josephine in black check with wreath print; Anneliese child’s apron in candy canes and velvet trim, Lily in tartan plaid with a holly print box pleat, and Natalie in a dark green holly with maroon ruffles. 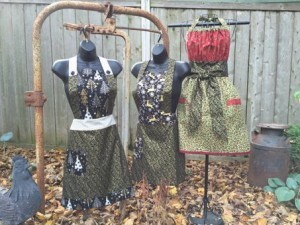 All are available now in our catalog! 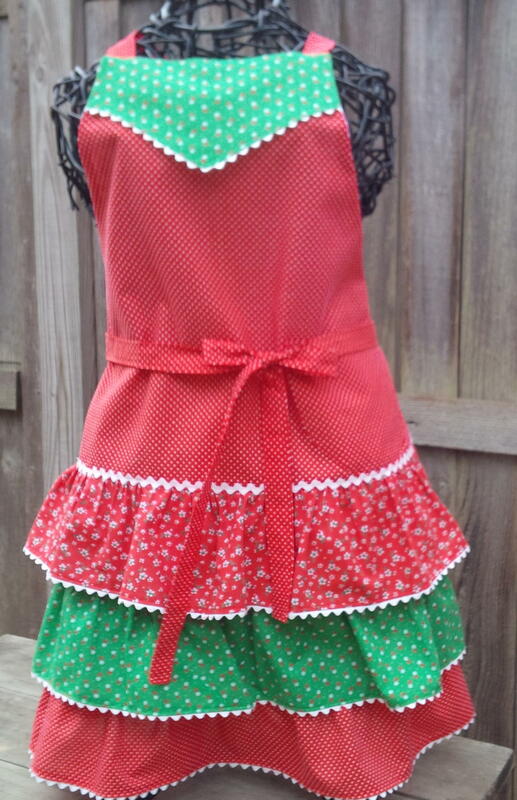 Our newest style, Josephine, in a retro stripe and poinsettia print, paired with another Anneliese child’s apron. 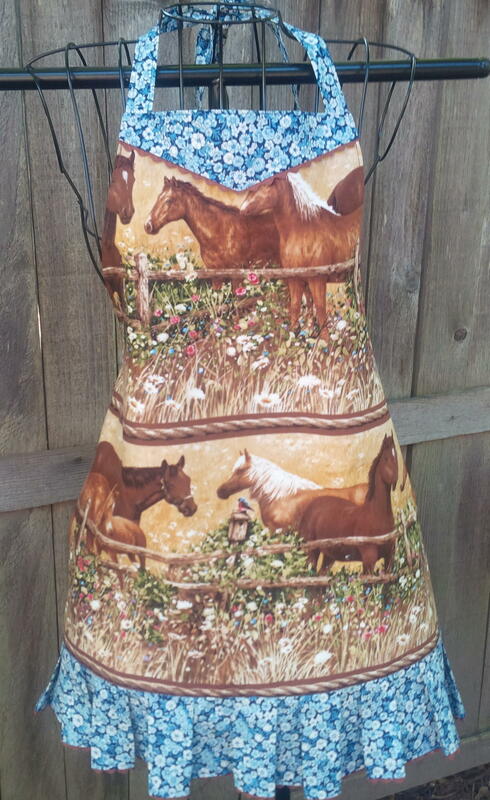 I love the sweet vintage handkerchief detail on the bodice! 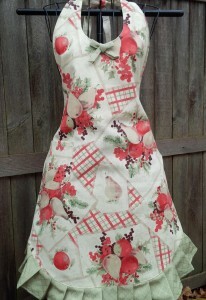 Susan apron in a soft cream and green fruit motif. 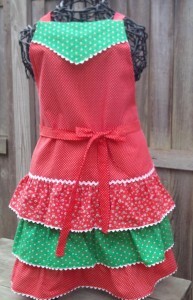 Removable bow for bodice or pocket. Festive red dotted swiss with holiday prints in the Gigi style. 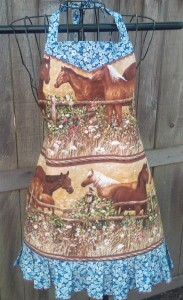 It’s fun to play with fabric and style combinations. 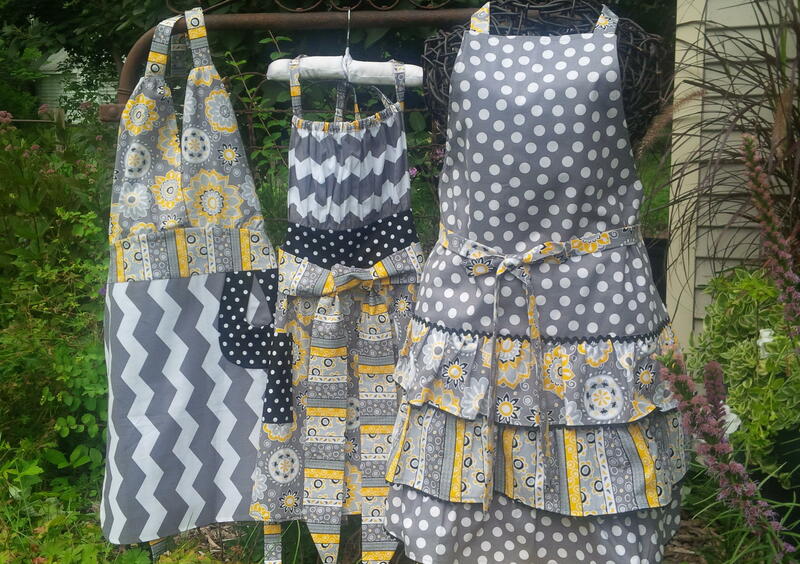 We love this set of aprons in grey and yellow coordinating prints that were a custom order for three sisters; the styles are Ellie on the left, Josephine in the center and Gigi on the right. 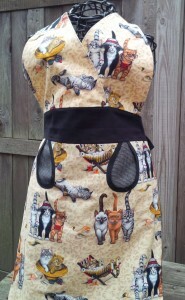 This special order was a gift for the ultimate cat-lover; she already had the matching pot holders! !